"Race" games are are games in which the main objective it to be the first player to reach a goal. Typically, this involves moving game pieces around a playing board, according to the rules of the game. The winner is the first player to move all their pieces to the "home" position on the board. Race games are some of the earliest board games to be invented, appearing in India and the Middle East thousands of years ago. Today, Backgammon is the foremost game of this genre, and also one of the most popular. If you have problems winning a race, then this is the game for you! 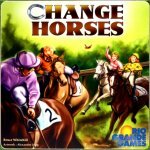 Change Horses is a unique racing game where the object is to finish last. Before the game, players are secretly assigned a horse. It is essential that everybody else's horse crosses the finish line before your's, so everybody tries to move their opponent's horses forward. In this tactical race to the back of the pack, every card played can change the outcome. And if you can't rein in your own horse, you can always change horses! Formula D transports you into the turbulent world of Formula 1: Don't lose control of the engine in the last bottleneck, master the chicane, stick to your opponent's back wheels, take advantage of the slip stream and then coolly overtake him. A Formula 1 pilot has to be willing to take risks and be able to plan ahead -- at least if you want to get to the very top of the winner's podium. Formula D also means the suspense of illegal racing on the streets of the big cities. Anything goes: customized cars, nitro fuel injection, skidding in roundabouts, unfair tricks. The game principles always stay the same, but different cars, rules and circuits come into play. Race against your fellow drivers in the annual Gumball Rally from San Francisco to Long Beach. Take your place in the line of cars, and play a Race Card. When your Race Card number beats the one in front of you, or your card color matches the car, you hit the gas and pull ahead to pass him. Make your way to the lead position, and then do your best to stay there. But watch out for those Hazards--they can send you spinning to the end of the line. Play continues until someone draws the Checkpoint or Finish Line cards hidden somewhere in the final 12 cards. Earn the most point cards based on race positions and walk away with the coveted Gumball Rally trophy! Pedal to the metal for your next game night! Featuring all the exiting elements of the original and award-winning game along with some new twists, Bookshelf Edition Raceway '57 lets you experience the full throttle excitement of America's fastest sport. Players roll dice or play a card to move their classic cars around the track, all the while managing valuable resources such as fuel, tires and suspension. Features cast metal car game tokens, perpetual dial gauges, and custom game play cards. 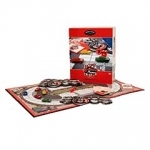 Raceway '57 is a game for two to five players, ages eight and up. Featuring all the exiting elements of the original version of the game, Discovery Edition Raceway '57 lets you experience the full throttle excitement of America's fastest sport. Players roll dice or play a card to move their classic cars around the track, all the while managing valuable resources such as fuel, tires and suspension. For 2 to 5 players, ages 8 and up. Be the first to fly your rocket towards the Space Stations to gather supplies! But watch out! Asteroid fields and Black Holes may hurtle you backwards through Space. This is a great basic strategy and deduction board game for kids. Its easy enough for beginners, but enough fun for adults as well. Spend a fun day at the track with the Racing Horse Game! Roll the dice to move the horses along the sliding wooden track. Whoever holds the cards that match the number of the first horse to reach the end of the track wins! Includes wooden game board, chips, cards, and dice.